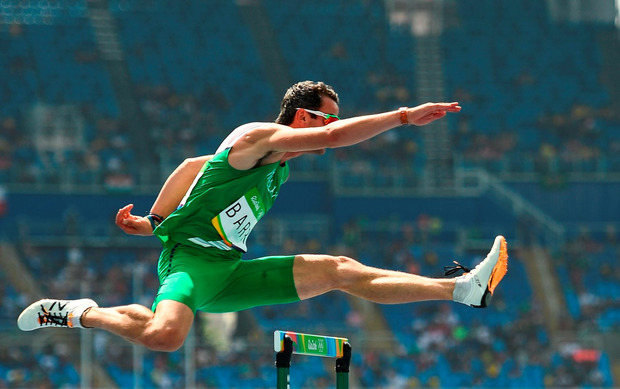 Eighty-four years - that's how long it's been since Ireland had an Olympic semi-finallist in the 400m hurdles, but Thomas Barr will end that drought in Rio tonight. When he takes to the track at 1.45am Irish time, he will walk in the footsteps of a sporting giant. The last man to achieve that feat, Bob Tisdall, went on to win gold at those Games in Los Angeles, and though that will be an impossible ask - at least at this stage of Barr's career - making the final suddenly appears within reach. The 24-year-old from Waterford made a surprising but supreme Olympic debut yesterday morning. As temperatures soared into the mid-30s, Barr made a scorching start to his campaign, finishing second in his heat in a tremendous season's best of 48.93. "I didn't expect it," said Barr, and neither did we. The Ferrybank athlete had struggled with injury for much of the year, missing 11 weeks in the spring and recovering his fitness just in time to compete at last month's European Championships in Amsterdam. There, Barr was unceremoniously dumped out in the semi-finals after being unable to crack 50 seconds. At that stage, his Olympic prospects appeared grim. But class is a permanent commodity, as Barr proved again yesterday afternoon. He was ranked seventh of the eight competitors, but attacked his race from the outset with aggression and precision, turning into the home straight in third and powering off the final barrier to take second behind Japan's Keisuke Nozawa. If his fist-pump after the line seemed excessive for a qualification heat, you could forgive him that, for just a month ago Barr seemed destined to become an unwilling member of the happy-to-be-here brigade. "I didn't think I'd be up there, so to go sub-49 in my proper race of the year, one where I'm ready to go, is incredible," he said. "I'm definitely back to where I need to be. I can't believe I'm saying that now after the last couple of months." And now, Barr will have a chance at creating another piece of history. Only the top two will automatically advance to the final tonight, but the Irishman is drawn ideally in lane four, and there is no one among his seven rivals he will deem unbeatable. "I'll go out and be much more confident in the first half of the race, drive at it and come home nice and strong," he said. "It'll take a low to mid-48, definitely a PB, to make the final. I'm in bonus territory now given where I was this year. This has filled me with excitement so I'm looking forward to it. Anything can happen at a championships." One athlete who can testify to that is Sara Treacy, who crashed to the track after a collision between athletes in her qualifying heat of the women's 3,000m steeplechase on Saturday but was re-instated to yesterday's final after an appeal by Athletics Ireland. In truth, Treacy was never likely to be a factor in the final - the race was won by Bahrain's Ruth Jebet in a blazing 8:59.75 - but the Meath athlete was nonetheless disappointed with her 17th-place finish in 9:52.70. "There's no way I can walk off the track saying I'm happy with that performance," she said. "I'm not that type off athlete. I tried to make the most of the opportunity. I did what I could but my legs just weren't playing games." Treacy was on course for a huge personal best in the heat before crashing to the track with less than three laps to run, but the 27-year-old refused to be downtrodden as her experience came to a close. "I can't be disappointed having run an Olympic final," she said. "I got a chance people on the team would give their right arm to do. I had a great day today so I have to take it and move on."